Who let those dogs out and why aren’t they in Yet?!!! My mind – that is not easily taken to the heights of temper – is boiling mad right now! Nonetheless its my own self slowly dissolving into this anger of not being able to do anything for the humans, the Muslims being hunt down in Burma. Atrocious, dirt, insanity, rage , crippled , disdained, shot down , cursed! what not am I feeling !!! I have been watching , observing, tolerating , sulking , cursing and just cursing in heart the massacre that is just not coming to an end! I have been watching all this in hope – and what hope? Was it just a pep talk given by me to my ownself each day or this was the height of my being insensitive to all this ? I have seen people shouting where is humanity lost. And I am a part of this society this hypocrite system – mind you! I admit I am !! But even still, I saw Writers , writing , commentators commenting, newscasters : informing!! They all doing their job , but that’s it ? done ? Oh wow! So now we are just narrowed down to play our social roles and professional roles and done?! Wonder is it to satisfy our ownselves to flee the guilt that we may feel in case if we don’t get up and get it out of our systems like I am just doing or is it because We are really messed up beings having no power but the power of writing, again like I am doing !!! There are people raising voices at social networking sites.Twitter, facebook, this book that book! You name is and there you have it. Hashtags used to make the phrase STOP KILLINGS MUSLIMS IN BURMA appearant enough and then again the next moment all calm, all passion for the Muslims rescue curbed down! This is not just a test for those Muslims being burned down, cut down hunt down in Burma. This is our damn test as well. And Its getting heavier and heavier and choking day by day on and On! 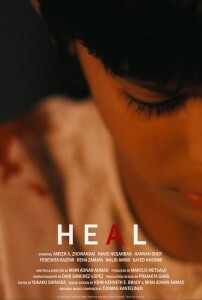 Try leave asking for your self and pray just for those innocents in each prayer, do you have the heart to do that ? You need self hatred for that first– self hatred for always bloody being damn concerned over your own life your own demands. And do not dare raise a finger on God here. He didn’t make you healthy and wealthy just to dance about in the world or totally lost logic and start killing in the name of so called damn self created religion. This is our own created mess. When I couldn’t control the anger boiling inside, I put a damn short status on facebook hell , “Where the heck is UN, and NATO now” and there came a flood of answers shouting HUMANITY IS DEAD! MUSLIMS ARE DEAD. MUSLIM NATIONS ARE DEAD! DEAD? what the heck am I doing here then ?? why the heck all those handful of people shedding tears for them ? Why am I concerned over who let those dogs out and why aren’t they bloody in yet for killing thousands of innocent humans. That can’t be all for the citizens of this Universe. There has to be more. the humans who have no concern for humanity – their own humanity to be specific – I am just saying , WE ! COLLECTIVELY AS MUSLIMS – that goes out to the Arabs wearing silk gowns , sitting on leathered chairs, The Not so respected Leaders of Muslim states all over the world, The crap organisations where they sit like dummies just worried over HOW TO PUT SANCTIONS over Iranian Nuclear Program, How to win Olympics 2012 this year, how to bloody win that oil tank, The selfish – hypocrite and self obsessed people that unfortunately lead us, You guys! have failed to curb down this situation. And we are letting u do so. Shame on US! As if the blood of Palestinians wasn’t enough…..
Oh my Gosh! I’m so sorry, that’s the wrong picture there, just the remains. Actually I was so hungry that day – ke bas. Let’s rewind back to the beginning on how I came across the most royal dish on the face of earth I have ever tasted for your sake. Spaghetti Bolognaise, ladies & Gentlemen! 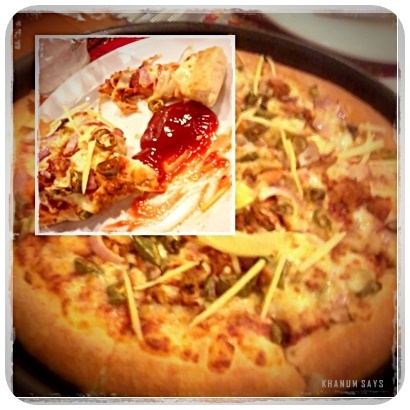 Pizza Hut | The place to be when you want to have posh food *m serious * in a foody n posh environment *m very serious again* and with posh friends, *now you can laugh*. 😀 I hope my gals are not reading this. It was our last day of examz and we all decided to hit the place. Now check this out , we are such innocent Pakistanis , pizza is almost like a street food in west and here we are, eating pizza with forks and etiquettes in Big Name Food chains Restaurants just cause of our crippling economy, west’s street food is our 5 star food! And right now if any agent of Pizza hut is reading this post – he is planning to hunt me down and sue me. 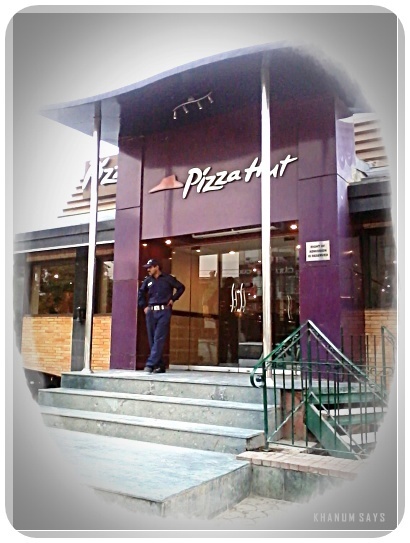 Please do wait , there’s more at This branch of Pizza hut located at M.M.Alam road in Lahore. First thing first – I give the staff 100 stars. Umm and ok lets be generous some more, I would give the environment 100 plus too. It was neat and clean and very airy. And oh! The guy standing at the entrance greets you with Assalam o Alaikum! so nice and so — nice again I must stress. Lets give him the award of Mr. Good Manners who had weird Moustaches. I am just being generous nothing else. Now behold the Menu card where I fell in love with Spaghetti Bolognaise. Our order spanned over 2 large pizzas, Chicken Tandoori and Chicken Fajita, 3 Salads , Someone ordered some shahi chicken rolls , Another ordered Lasangna, While I ordered Spaghetti Bolognaise to share with my friend. 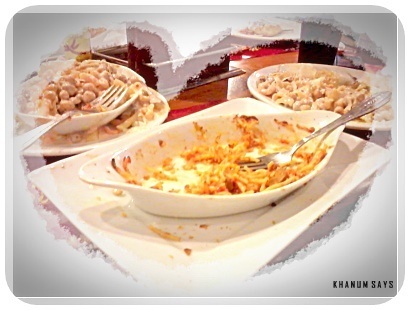 Seeing this, 4 of my friends also ordered the same dish and shared in half. 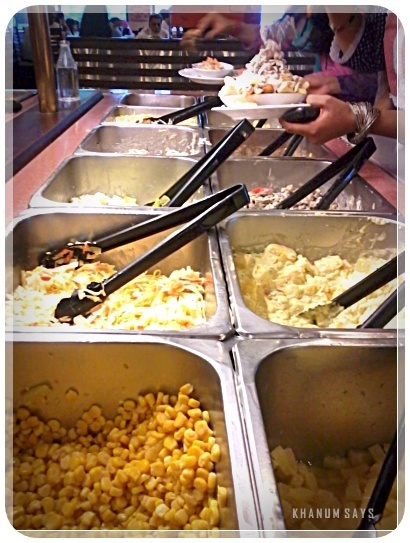 Now – the salad bar, before the Pizza came we attacked on the salad bar and as you can see in the pictures , this is the place where even the damsels give up on diet and load heaps and heaps of salad in one small tiny little bowl. We payed Rs. 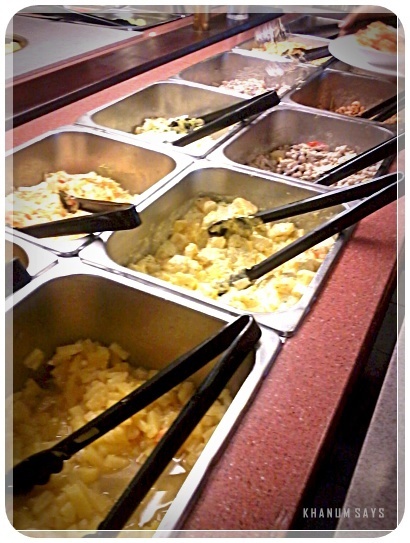 330 for each bowl of salad after all. How could we spare that and not halal the money? 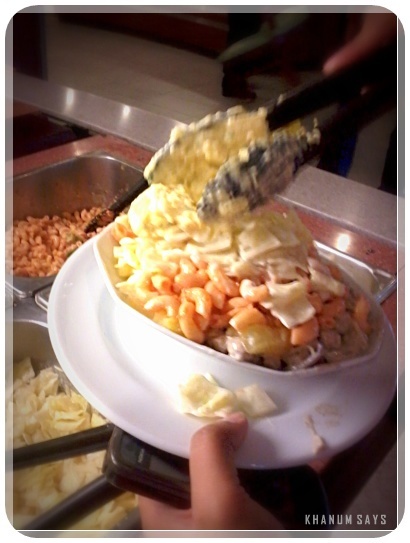 There is my friend, Masha Allah , in process of making a sky-scrapper in the bowl. Next stop – Pizza Sheeza! Now this is my plate on top of the pizza. One slice and there I was – all full. 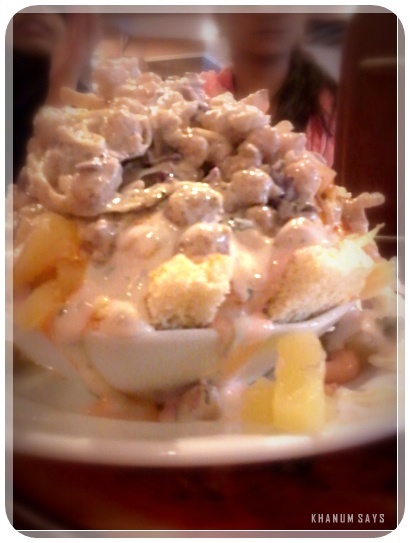 I wonder how do guys eat so much. Pizza Hut people must hate men for eating up more than they pay for the deals. As for girls, I think we just mostly waste food and money. 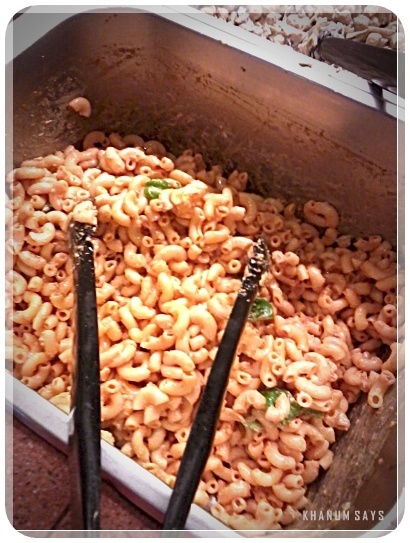 Like my friend she went to the salad bar and came back with a small circle of – no actually it wasnt even a circle it was a dot of salad in the middle of the bowl. The moment we saw this insult of salad bar and our money we were like. GASP!!!! WHAT DID U DOOOOOO !! NOOOO NOOO NOOO!!! HOW COULD YOU WASTE 330 RUPEES AND NOT FILL THAT THING UPPPPPPPPPPPPPP :O :@ … “Haan meinei socha itna bohat hai” was her reply. Right! Anyways, The pizza was good enough so as the salad. Yummy! Lets move along now. Finallllyyyyyyyyy to our big surprise dish of the year. 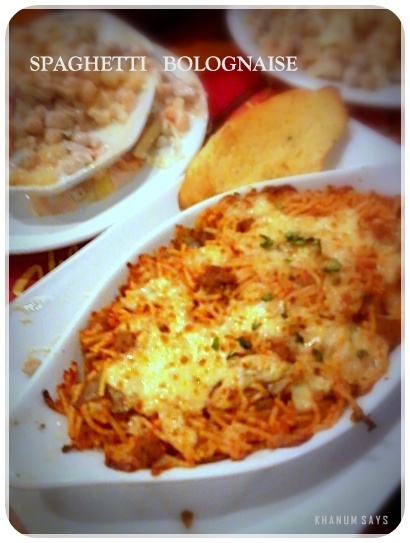 Thank you very much for reading khanum’s review on Spaghetti Bolognaise. Click here for My final serious verdict on Pizza Hut’s Special Recipe , the ravishing remarks on the dish that is just made of noodles and mashrooms and very alien taste. But P.S. 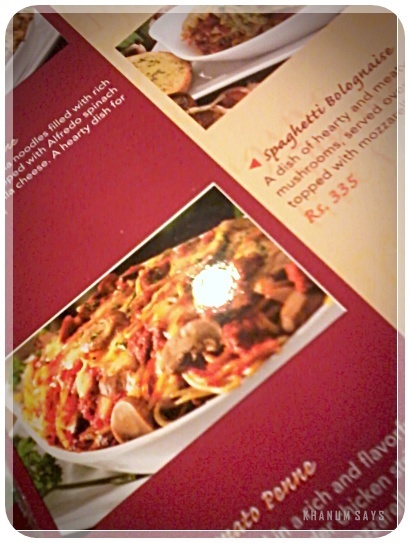 Lunch at Pizza Hut cost us Rs 4000 and sumthing sumthing. And since we were total 10 people we divided the amount and it came down to 500 each. Next Place to be explored: Tutty Fruity, Insha Allah. I am a huge fan of Allah, and His creation in the space. Hence I drool over , simply drool over such phenomenon and their images all the time. Only if I had a telescope, I would have shared pictures with my copyrights however, that’s for today: Images uploaded by ScienceAlert on facebook. 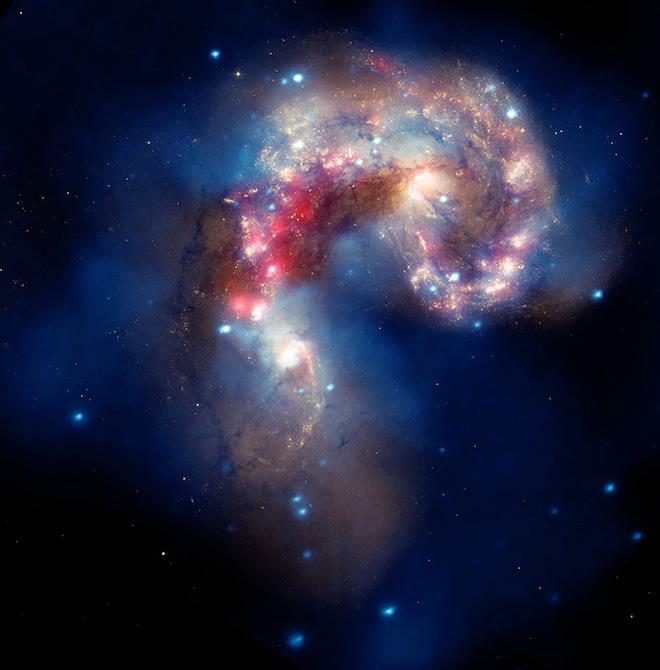 This composite image given above of the Antennae galaxies contains X-rays from Chandra (blue), optical data from Hubble (gold and brown), and infrared data from Spitzer (red). The X-ray image shows huge clouds of hot, interstellar gas that have been injected with rich deposits of elements from supernova explosions. This enriched gas, which includes elements such as oxygen, iron, magnesium and silicon, will be incorporated into new generations of stars and planets. The bright, point-like sources in the image are produced by material falling onto black holes and neutron stars that are remnants of the massive stars. Check out a few images from a beautiful gallery put together by Wired magazine of galaxies colliding. 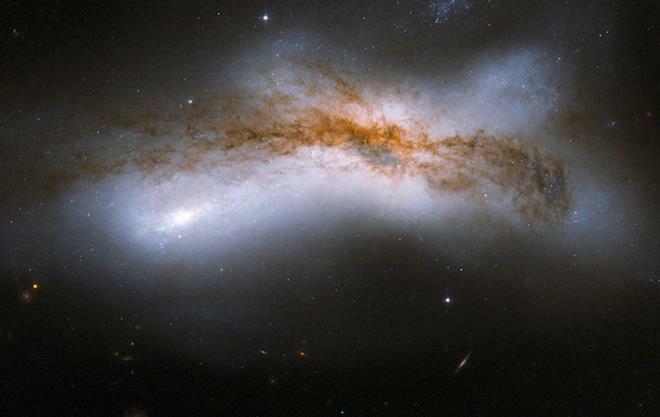 Galactic collisions are among the most ferocious and stunning events in our universe. 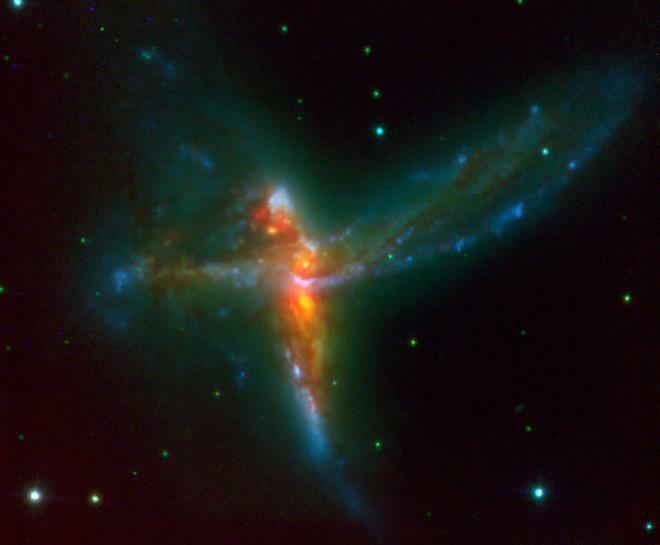 These cosmic pile-ups occur whenever galaxies become gravitationally attracted to one another. Multiple galaxies may spiral around each other for billions of years, creating odd distortions and beautiful trails of stars as they pass. Eventually, the objects crash together in a forceful embrace. Since the first galaxies coalesced several hundred million years after the Big Bang, their collisions have been influential in shaping the history of our universe. Isn’t it a breathtaking sight? : ) wow hai! Is your Ramadan going the right way, O’ Muslims? Many a times what happens is, we wait for the holy month of Ramadan with such great fervour and zeal but when it actually arrives, 1day of passionate fasting happens and that’s pretty much it. The laziness after iftar and the sleepy eyes at Suhoor time takes over. I usually try to take a nap after zuhr but that 1 minute nap , we all know, is actually a big satanic movement! You too end up sleeping till maghrib then dont u ? 😀 dont hide now. I have met many people in life who skip suhoor just for the sake of better sleep. And then I have met those people as well who have no interest in offering prayers what-so-ever. That’s no fasting Dear Lazy Muslim. Please revise your Ramadan routine and put your heart and soul into this month. I know you may have your own level of spirituality you know, like I have my own where I dont like people poking in their noses so you might have your own space with Lord ALmighty where you are given free hand at many things in life but listen human, you can’t use that as an excuse to skip the obligatory acts that includes offering 5 times prayers a day. Getting ? 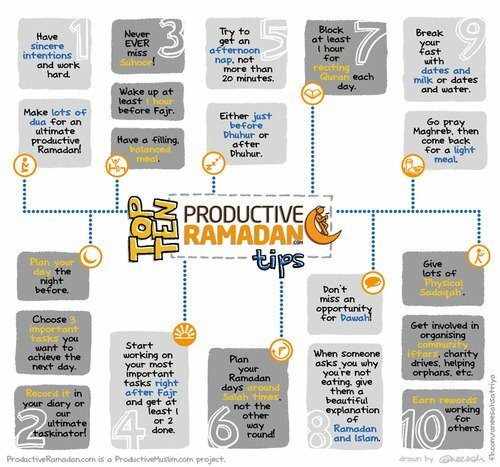 I observed the routine of many people and I came across some pretty cool chart by Productive Muslim as well on how to form your Ramadan routine. As you can see below it’s a very basic yet complicated looking thing. 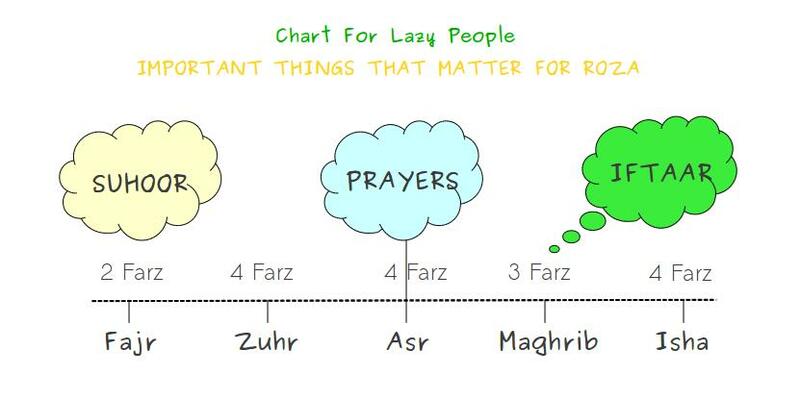 People who wanna do the “struggle” , keyword struggle to fast better would bother follow that but I am basically speaking of “lazy” people in my post, keyword lazy, who are at the first step of Fasting. So I made out a very easy chart for your understanding. This Ramadan, Your Goal is One. TO PLEASE ALLAH ALMIGHTY ALONE. How to Achieve this target ? Simply follow the basics. 1- Wake up for Suhoor with a happy and content heart. Do not be lazy. 2- Finish suhoor and Offer your 1st Daily obligatory prayer, Fajr. Do not be lazy. 3-Keep praying all your prayers through out day , Zuhr and Asr with the same determination and love for God that you had at Suhoor. Pls, do not be lazy. Offer Taraweeh if you please, if you don’t want to do that just go to bed when you please and offer the same cycle again. Congratulations! You are now a productive Muslim headed in the right direction this Ramadan! Apart from this please keep in mind, there are some etiquettes of living as a Muslim that get high during the holy month of Ramadan. Meaning, we are expected to behave more good during this month. Lying, backbitting, stabbing, murdering, saying evil, doing evil, hearing evil all this must be STOPPED! I shall speak on this in detail in another post INsha Allah, for now, just do yourself a favor 🙂 be good and have a Happy Ramadan. I remember in childhood, we used to have this fantasy that Allah has a phone number and the phone number is 24434! If you notice, its the obligatory prayer units number for each prayer, 2 for Fajr, 4 for Zuhr, 4 for Aser then 3 for Maghrib and 4 for Isha. Simple and easy. How often do u dial it? Daily? So stead fast, fasten your seat belts and get going! You have an important appointment with Allah each day this month or perhaps, throughout the year if you really ponder. And lastly pray as much as you can. Sincere pious Dua is your ticket out from the fitnah of this world and the akhirah! Listen to it and see the visuals. What should I write? WHAT should I write? WHAT I SHOULD I WRITEEEE??? uhhh I have been going crazy lately thinking of a post. Spirituality ? No. I am keeping it personal. Ramadan wishes? No. Every blog is talking over it. Food? A BIG NO! I am bored of food posts lately. 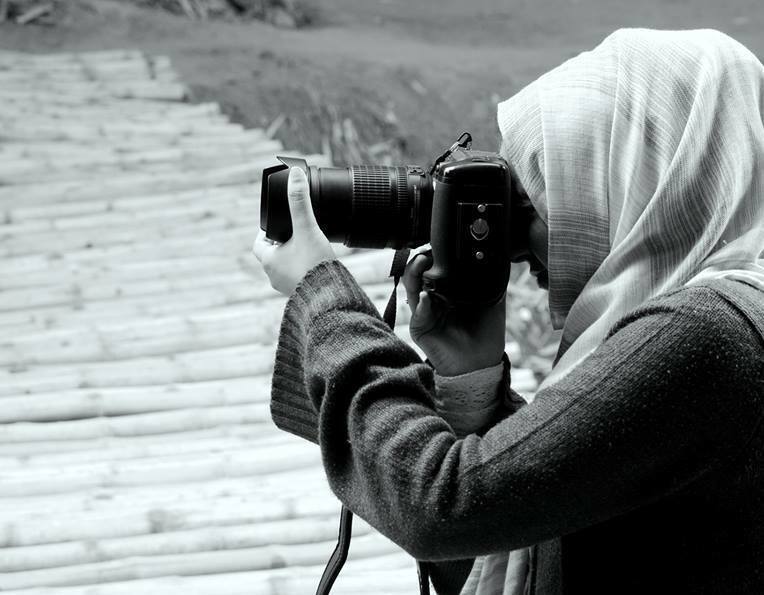 Photography ? Nooo, that too has some issues lately. I heard a lot over Saieen creature. 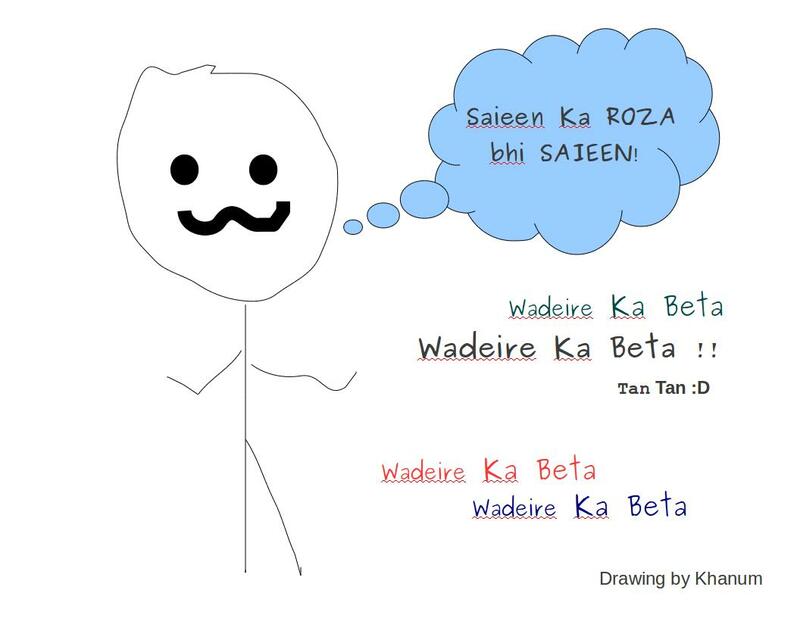 Like Saieen ka facebook bhi saieen , saieen ki moonch bhi saieen but I had no idea what saieen is all about until in the morning my cousin actually showed me the hilarious WADEIRE KA BETA moves and told what the mania is about! Well, its a song! Yes A damn song based on a comedy sketch by Ali Gul Pir. And apparently Everybody is in Saieen fever these days! This character reminded me of Zardari, his son and those lazy people in this world who are so Saieen-ish that they joke even on the very practice of Ramadan. Observing fast without praying is like sucking up the sheesha pipe without burning the coal, you ain’t getting anything out of it bro! — A bro said on Twitter. I guess I have successfully made an awesome point after days! Phew! See ya after more prolonged days now! And Ramadan Kareem to all.